a) Gluten-free cakes are one of the most difficult things. 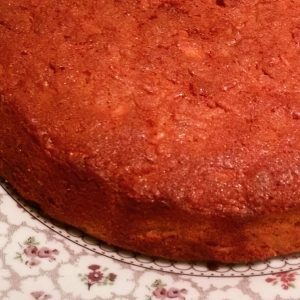 It’s the gluten that makes cakes so deliciously cakey, and I’ve often thought it foolish to even attempt gluten-free cake. Plus I decided to avoid any gluten replacements, such as xanthan gum, and stick to the simplest recipe possible. b) One of my dinner guests, Kate is a seasoned baker and has worked in commercial catering for many years. Well, yesterday it rained a lot (maybe that helped with the moistness), I had a good fan-assisted oven heated well in advance, I precision-measured everything (well, almost everything), and I exercised considerable mindfulness and intuitiveness in sieving, beating, whisking and folding. The result was nothing short of a miracle. I had my doubters. Myself, of course – having failed at cakes so many times in the past, whichever flour I used. And my husband, who came into the kitchen halfway muttering something about why am I bothering, my cakes always go wrong, and our dinner guests were due in less than 2 hours. Plus this was my own recipe, inspired by looking through various similar recipes, but also through remembering the basics of cake-making I learnt at school and with my mum. But as soon as I saw how fluffy and cloud-like the cake batter was as I spooned it into the well-greased and lined cake tin, I got excited. There were sparkly gluten-free butterflies in my tummy. The verdict: everyone loved it! I loved it! In fact, Kate suggested this recipe could be used as a fool-proof base for any gluten-free cake recipe. And I think she’s right. So here’s the recipe, and a few notes on some of the ingredients I used. May you have as much success (and are as easily excited about it) as me. Stir in the rest of the eggs and flour, plus the baking powder. Very gently stir in the grated apple and cinnamon. Serve on its own, or with cream, coconut cream, cashew cream, creme fraiche, yoghurt or custard. I used brown rice flour. I use that in a lot of cooking: pancakes, sauces, pancakes – well, mainly pancakes! I like the fact that it is a wholegrain flour that is naturally gluten-free. I have heard many people complain that they don’t get on with its texture, but I have never had any complaints, and it worked perfectly here. Feel free to experiment, however. Coconut sugar is not usually my first choice of sweetener. I’m a big fan of raw honey and molasses. None of these are sugar free, but I love the additional nutrients and healing properties that raw honey brings (although you do lose some of these when you heat them). And I love the treacly taste and texture of molasses, plus the fact that it’s pretty much all the goodness that gets stripped from sugar when they make your regular white cane sugar. However, for this recipe I wanted something dry so that I could use a traditional recipe (equal flour, sugar and fat) without messing with the consistency. I was going to get an unrefined cane sugar, something like rapadura, for a sugar that hadn’t been stripped of most of its nutrition. But then at the last minute I decided to splash out and buy coconut sugar, which also has many more of its nutrients intact. So this cake isn’t sugar free (I dont think any “sugar-free” cakes are), but it is free of refined sugars. So this isn’t something I would eat every day. Just sayin’. The butter I use is from pasture fed, organic dairy cows and is so beautifully yellow. If you’re avoiding dairy, then try coconut oil instead, but you’ll probably find you need a bit less of it. Please don’t go anywhere near super-processed margarines. How sweet the apples are will affect how sweet your cake is. I used quite tart, local apples as I don’t like overly sweet things.